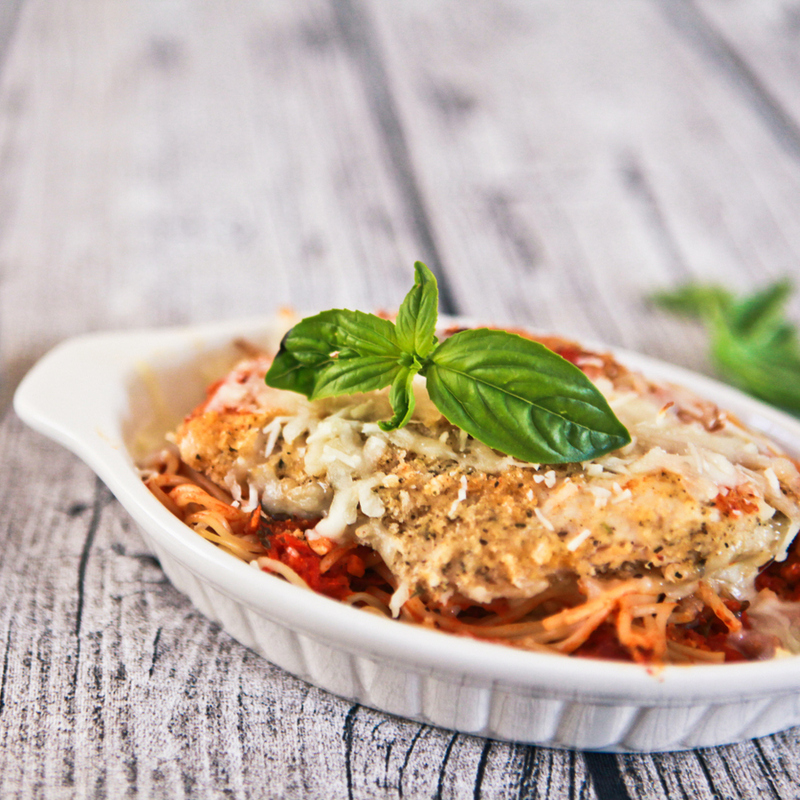 Chicken Parmesan is one of my favorite favorite dishes to make for a dinner party. It is actually pretty simple, but feels so fancy and everyone loves it. 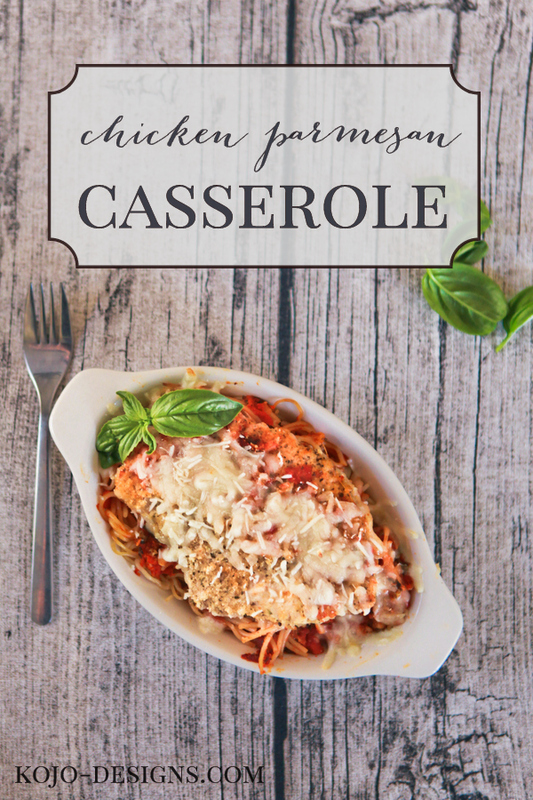 Making it as a casserole, instead of individually baking each piece of chicken under the broiler, makes it a lot easier to make for a crowd. If you still want that personal “flair” though, still follow these directions, but instead of making a 9X13 pan of them, put them in small personal size baking dishes (like the pictures). Using a meat pounder, or rolling pin pound the chicken to an even 1/2 inch. Line a tray with paper towels and place the chicken on the tray. Sprinkle with salt and let sit, at least 10 minutes. Meanwhile, combine the bread crumbs, parmesan cheese, salt, and herbs in one shallow dish. Put the flour in a second shallow dish. Beat the eggs and put them in a third shallow dish. Cover chicken with more paper towels and press firmly to absorb any moisture. Dredge the chicken first in the flour, second in the eggs and third in the bread crumb mixture, pressing firmly to make sure the breading sticks. Heat half of the olive oil over medium heat in a large skillet. Once the oil is very hot (but not smoking! ), add two of the chicken breast to the pan and cook until golden brown, about 3 minutes. Flip the chicken over and cook on the second side another 2 1/2 to three minutes (if the oil starts to smoke, reduce the heat) Remove to a plate lined with paper towels. Discard the oil, wipe the skillet and then add the other half of the oil and repeat the cooking process with the remaining chicken breasts. To assemble the dish: Heat oven to 350. Drizzle olive oil in the bottom of a 9X13 glass dish, add the cooked spaghetti and pour 2 cups of the marinara over the pasta. Next arrange the breaded chicken on top. Top with the mozzarella, and then finish with the parmesan cheese. Place in oven and cook for 20-30 minutes or until the cheese has completely melted and is bubbling. 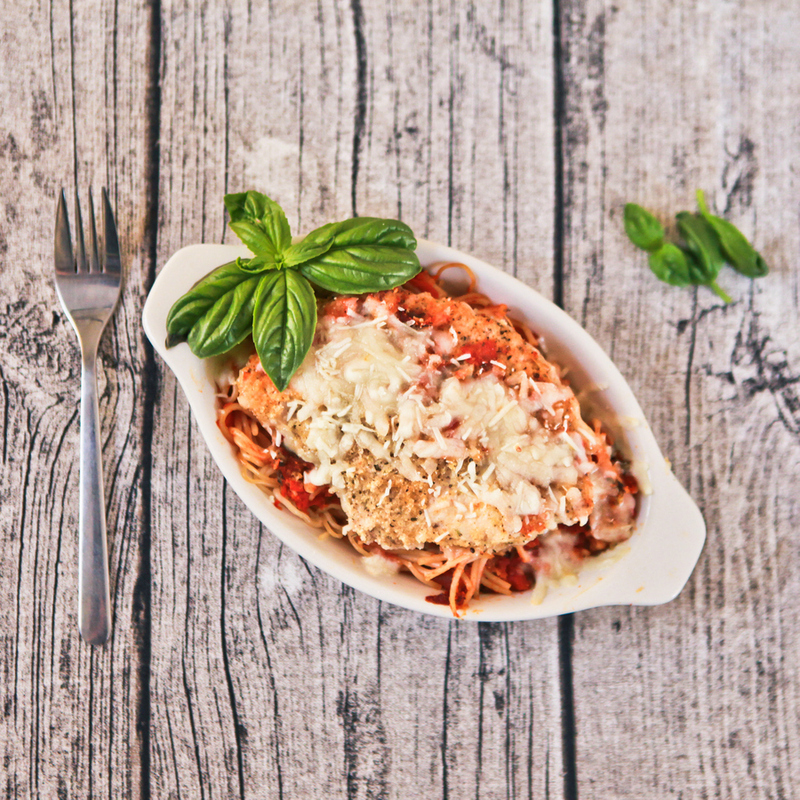 Serve with more marinara and fresh basil (optional). *NOTE* if you know would like, you can cut the flattened chicken breasts into smaller cutlets so that there are smaller portion sizes in the final dish. Just cut them after pounding them out and prior to breading them. I cut all the breasts into 2 pieces, so that we have 8 smaller cutlets for our family of 5. *SECOND NOTE* This casserole freezes wonderfully! While making the mess, go ahead and make two and freeze one. For the frozen casserole: Don’t add the cheese to the top! put in in a bag and freeze it separately. Put in in the fridge the night before you plan on eating it to thaw it a bit. Heat oven to 350 and cook covered for 30 minutes. Remove the lid and add the cheeses. Cook uncovered for another 20-30 minutes or until the cheese has melted and is bubbling.